Mechanical complications of peritoneal dialysis catheters are frequent and often prevent the good daily exchanges. This results in poor-quality dialysis. The malfunctioning due to shifting of the catheter tip, kinking and obs­truction due to fibrin deposition or a clot in the catheter are the main mechanical complications reported in the literature. , Perforations of the nearby organs are rare, and very few have been reported. 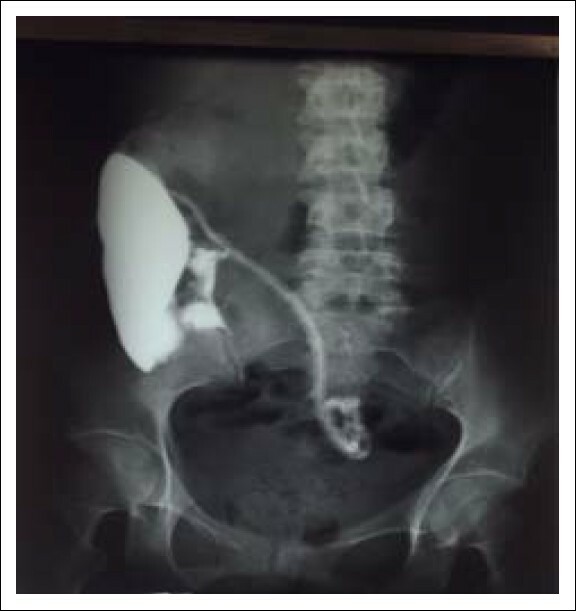 We report a case of bladder perfora­tion in a patient on treatment with peritoneal dialysis (PD). Mrs. M. H., 38-years old, is a known case of autosomal-dominant polycystic kidney disease (ADPKD) and hypertension discovered in 1994 during the exploration of an abscess of the right kidney. Family survey revealed that other family members also had ADPKD. In 1999, she was hospitalized for toxemia of pregnancy with renal insufficiency, with serum creatinine of 200 μmol/L. One year later, in April 2000, she reached end stage renal di­sease (ESRD) and, since then, the patient is on treatment with automated PD. In December 2003, she had recurrent peritonitis with methicillin-resistant Staphylococcus aureus (MRSA) requiring prolonged antibiotic therapy using vancomycin and a third-generation cephalosporin for ten weeks with complete resolution. Two months later, she presented with urgency to urinate and "urine" leakage during the in­flow of PD fluid. Chemical analysis of the lea­kage fluid tested positive for glucose, thereby denoting that it was the dialysate. A peritoneo-vesical fistula was considered as the possibility and a contrast study through the catheter con­firmed the vesical leakage [Figure 1]. Figure 1: A peritoneo-vesical fistula. The PD was discontinued and cystoscopic repair of the fistula was done. Two months later, filling the bladder with contrast media showed occlusion of the fistula and, therefore, to continue with PD, a second catheter was inserted under general anesthesia. However, ten days later, she developed pain and swelling at the subcutaneous tunnel of the catheter. A contrast study done at this time demonstrated subcutaneous leakage of the fluid [Figure 2] necessitating stopping of PD and removal of the catheter. The patient was then transferred to hemodialysis. Figure 2: Parietal extravasation of the contrast. Catheter dysfunction due to mechanical com­plications is frequent during the PD, causing poor inflow and/or outflow of the dialysate. The migration of the catheter tip catheter tip or blockage due to kinking is generally easy to solve by use of laxatives or by surgical manipulation. We report one case of the peritoneo-vesical fistula in a young and thin patient. She pre­sented 46 months after the beginning of PD with recurrent peritonitis with MRSA, which was resistant initially but responded to appro­priate antibiotic therapy with vancomycin and third-generation cephalosporin for a sufficient length of time. The prolonged stasis of the infected liquid and the non-removal of the catheter could re­sult in alteration of the peritoneal structure, and may explain the appearance of the peritoneo-vesical fistula. The diagnosis should be strongly suspected from the history and should be con­firmed by chemical study of the extravasating fluid and by the demonstration of the fistula using contrast study. The resumption of PD is possible after clo­sure of the fistula, like in our case, but a pa­rietal leakage appeared two weeks later, neces­sitating us to stop it again and transfer the patient to hemodialysis permanently. Several similar cases have been reported in the literature. This second leakage testifies the altered state of the peritoneal membrane secondary to the prolonged peritonitis she had with drug-resistant germs. The mechanical complications arising from catheter malfunctions during peritoneal dia­lysis are frequent and can generally be treated. The PD fluid leakages are rare and require a quick diagnosis and prompt treatment, inclu­ding temporary or permanent stopping of the procedure. The fistulas between the peritoneum and the nearby viscera are rare and are due to factors concerning the condition of the patient and the quality of the insertion technique. Improper treatment and extended period of peritonitis damage the peritoneal membrane and favor the formation of these fistulas. Because peritoneo-vesical fistulae are rare, and that too are commonly seen in the elderly and obese people, their occurrence in our well-dialyzed, non-obese young, female patient seem to favor the damage to the peritoneum from recurrent and prolonged peritonitis with re­sistant germs as the predisposing factor. 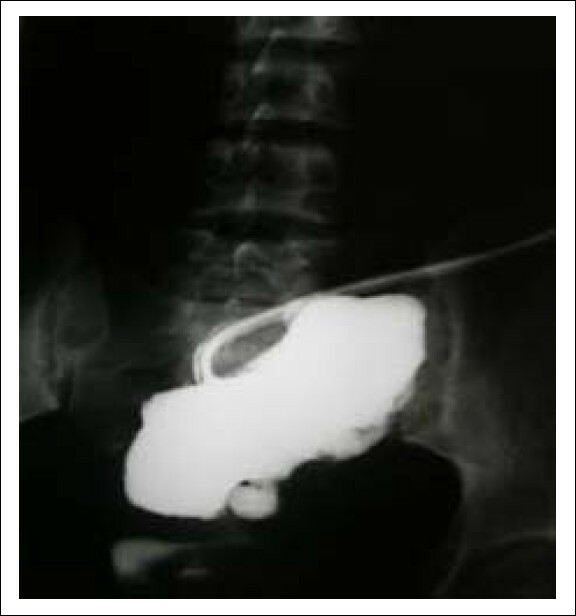 The position of the catheter should by regularly checked with radiography and peritonitis should be prevented and effectively treated. It is advi­sable to remove the catheter at the end of one week if there is no improvement in the clinical condition of the patient. 1. Ekart R, Horvat M, Hojs R, Pecovnik-Balon B. An accident with Tenckhoff catheter placement: Urinary bladder perforation. Nephrol Dial Transplant 2006;21:1738-9. 2. Allon M, Soucie JM, Maco EJ. Complications with permanent peritoneal dialysis catheters: experience with 154 percutaneously placed catheters. Nephron 1988;48:8-11. 3. Bullmaster JR, Miller SF, Finley RK Jr, Jones LM. Surgical aspects of the Tenckhoff peritoneal dialysis catheter. A 7 year experience. Am J Surg 1985;149:339-42. 4. Francis DM, Donnelly PK, Veitch PS, et al. Surgical aspects of continuous ambulatory peritoneal dialysis - 3 years experience. Br J Surg 1984;71:225-9. 5. Sanderson MC, Swartzendruber DJ, Fenoglio ME, Moore JT, Haun WE. Surgical compli­cations of continuous ambulatory peritoneal dialysis. Am J Surg 1990;160:561-6. 6. Bamberger MH, Sullivan B, Padberg FT Jr, et al. Iatrogenic placement of a Tenckhoff catheter in the bladder of a diabetic patient after penectomy .J Urol 1993;150:1238-40. 7. Moreiras M, Cuina L, Rguez Goyanes G, Sobrado JA, Gil P. Inadvertent placement of a Tenckhoff catheter into the urinary bladder. Nephrol Dial Transplant 1997;12:818-20. 8. Cronen PW, Moss JP, Simpson T, Rao M, Cowles L. Tenckhoff catheter placement sur­gical aspects. Am Surg 1985;51:627-9.